Providing you the best range of isolation transformer with effective & timely delivery. The quality and efficiency of transformers therefore are very critical and make a significant difference to the industry both in terms of uptime and energy costs. Considering the importance of this, we are offering innovatively designed efficient transformers that help industries through superior performance and lower energy losses. Transformers are critical equipment in the power supply chain of every industry and work 24/7 in most cases. The quality andefficiency of transformers therefore are very critical and make a significant difference to the industry both in terms of uptimeand energy costs. Considering the importance of this, we are offering innovatively designed efficient transformers that helpindustries through superior performance and lower energy losses. A double wound transformer with multiple shielding for Capacitive or Faradic Isolation (reduction of capacitive coupling). This transformer has very high attenuation of common mode transients thus preventing passage of voltage transients, spikes and galvanic leakage in the common mode from reaching sensitive electronic equipment like computers, medical equipment and CNC machines. It also addresses problems related to poor input neutral. 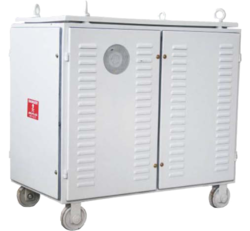 The Ultra Isolation transformer can be designed to provide output voltages to suit machine requirement. A double wound transformer with KRYKARD Advantage, which provides galvanic isolation and hence addresses problems related to input neutral. The galvanic isolation transformer can be designed to provide output voltages to suit different machine requirements.